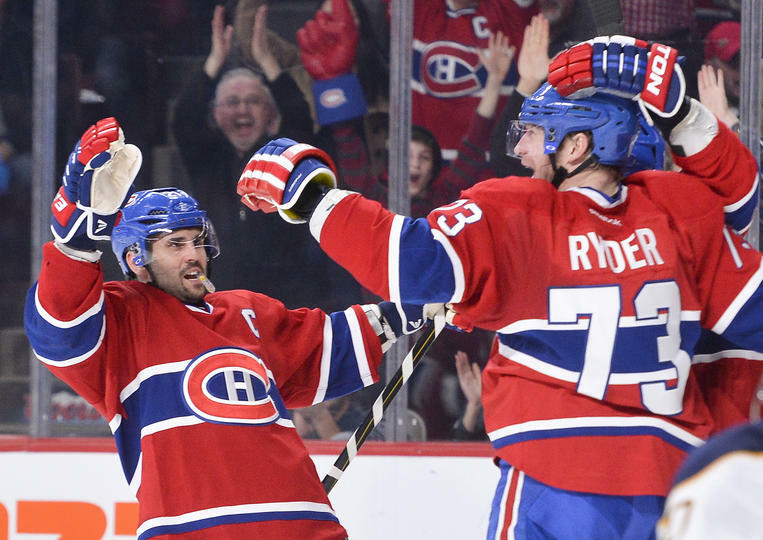 Buffalo came into Montreal after defeating the Toronto Maple Leafs in a shootout this past Thursday. That bumped Buffalo up in the standings, leaving them just four points out of a playoff spot. That’s incredible. There would be no scoring in the first 30 minutes of the game, and for Buffalo, that was a gift. The Canadiens outshot the Sabres 13-5 in the first period, and spent the majority of the first 20 minutes in Buffalo’s zone. 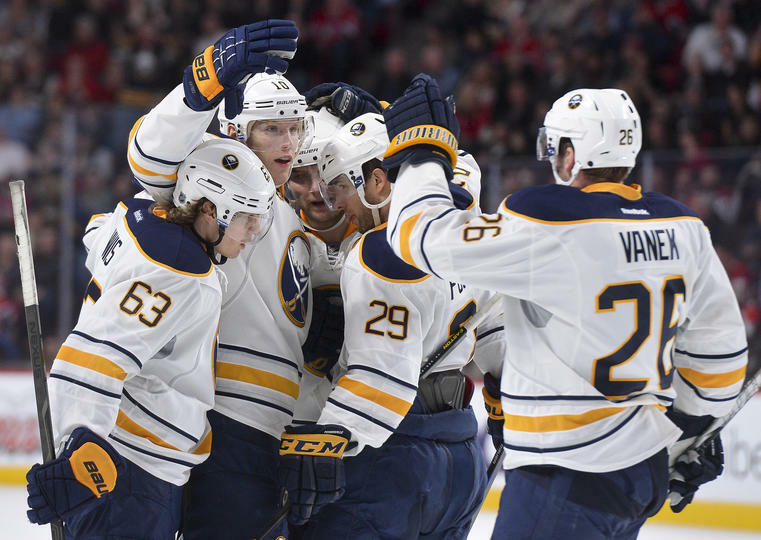 The effort Buffalo gave in the first period was what every Sabres fan is used to watching. Chasing the puck around in their own zone, not being able to clear the puck out even though there was a clear lane to do so, and Ryan Miller having to do backflips in net. You’d think the Sabres were out of this game, just like you thought they were completely out of the playoff race — but in classic Buffalo style, they prove us wrong. Nine minutes into the second period, Mike Blunden would be whistled for interference sending Buffalo to the power play. Just 39 seconds after Blunden’s penalty, PK Subban tossed the puck up over the glass which would give Buffalo a 91 second 5-on-3 power play. Cody Hodgson had the puck along the half wall in Montreal’s zone where he and Jason Pominville would play catch. As soon as Pominville got the puck back to Hodgson, Hodgson fired a pass to Ehrhoff at the point. Ehrhoff let a heavy clapper go right on net that deflected off of Thomas Vanek’s stick and into the net to give Buffalo a 1-0 lead. Goal Breakdown: Buffalo’s powerplay has been horrific all season, but when there are only three penalty killers out on the ice, the Sabres usually find the back of the net. On this goal, for me, it’s Hodgson’s mindset. He could’ve given the puck to Ehrhoff right away, but elected to play catch with Pominville for a second before sending it to Ehrhoff at the point. The two passes between Pommers and Hodgson spread the three defenders out wide enough so that Ehrhoff would have no problem getting his shot to the net. It also helps having Thomas Vanek planted right in front as well. The goal was originally awarded to Ehrhoff but the team asked for it to be reviewed. After the review, it was evident that Ehrhoff’s shot did go off Vanek’s stick before it hit twine. About nine minutes later, the Sabres did something that they’ve allowed other teams to do all season long; Score a goal in the final seconds of a period. Ennis lost the draw in Montreal’s zone, allowing the Canadiens to easily clear the puck. Brendan Gallagher had the puck at center and tried to send it up ice into Buffalo territory, but his stick broke on the dumping attempt. Gallagher’s fanned pass allowed Buffalo to get back into the offensive zone. Ehrhoff took the lose puck, and immediately sent it to Leino who was right on the Canadiens blue line. Leino received Ehrhoff’s pass and quickly sent a cross ice pass for a streaking Tyler Ennis. Ennis had Vanek cutting in front of the net, and hit him with a perfect pass right to the tape. Vanek patiently waited for Price to make his move, and simple dunked the puck on the open side to make it 2-0, Buffalo. It was a pretty three-way passing play. Goal Breakdown: The best way to describe the Leino-Ennis-Vanek line is: Crafty. Those three can create a scoring opportunity in the blink of an eye, and thats exactly what they did on this play. As soon as Gallagher’s stick broke, Leino knew right away that Ehrhoff would be the first man to the puck, and wisely crept towards the Canadiens blue line. Ehrhoff found Leino instantly and the play was on. Ennis was flying into Montreal’s zone when Leino received the pass from Ehrhoff. Ennis was clapping his stick on the ice calling for the puck, and Leino put it on his tape. Ennis quickly hit Vanek in front, and when Thomas Vanek is in front of the net with momentum and the puck on his stick, it’s usually going into the back of the net. The Sabres went into the second intermission up 2-0, and outshot 23-13. That’s absolutely amazing considering how awful Buffalo has been in the middle period this season. Montreal, however, would not go down without a fight. About seven minutes into the third period Marcus Foligno would be called for tripping, sending the Canadiens to their third power play of the evening. Andrei Markov had the puck in his own zone with just 46 seconds left in the power play when he sent the puck up to Subban at center. Subban chipped the puck in Buffalo’s zone, and quickly chased after it. Subban split three Sabre penalty killers, and got the puck back to the point for Markov. Markov immediately fired a shot/pass intended for Michael Ryder’s stick. Markov’s feed was perfect as it deflected off of Ryder’s stick and past Miller to cut the the Sabres lead to 2-1. Goal Breakdown: This was all set up by PK Subban who has turned into a power play specialist this season. Subban had the puck at center when he chipped the puck into the Sabres zone. Subban slipped in-between Myers, Leopold, and Kaleta, allowing him to get the puck back to center. Subban’s dumb and chase was so effective that it drew Steve Ott over towards the play which left the entire offensive zone wide open. Ryder noticed the Sabres out of position, and went right into the slot when Markov got the puck at the point. Markov sent a hard pass right to the tape that deflected in. Miller was helpless on that one. Subban made that penalty killing unit look like a joke when he chased the puck into the zone so cleanly that it drew all four defenders over. 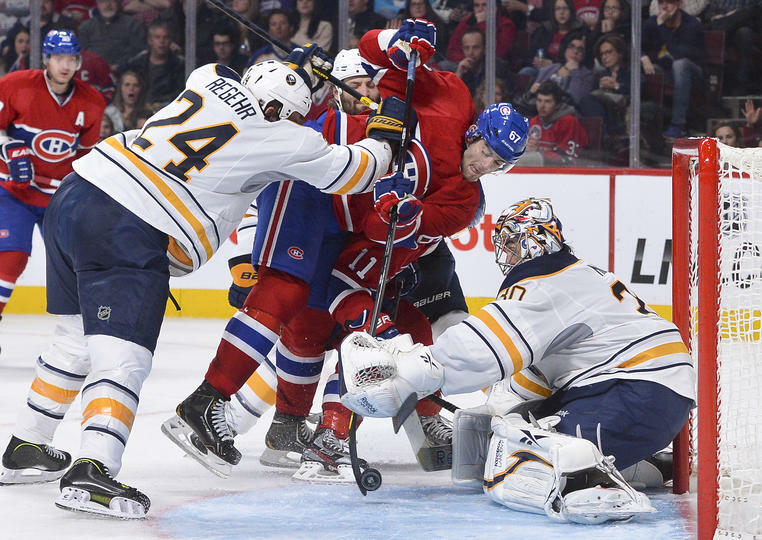 The Canadiens would continue to bring the pressure and would outshoot the Sabres 16-5 in the period. 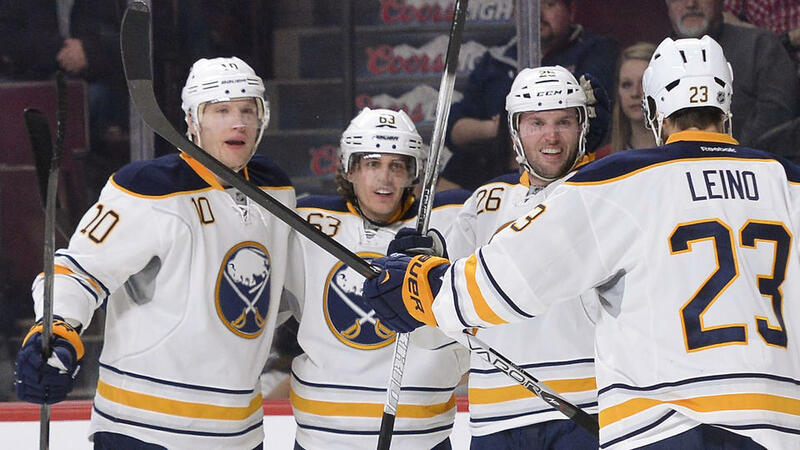 Despite being outshot 39-18, the Sabres still found a way to sneak out Montreal with two points. That’s something you wouldn’t say two months ago. Buffalo is now 4-1-1 in their last six games, and are on a current three game winning streak. A lot of that has to do with fantastic goaltending by Ryan Miller and Jhonas Enroth. Miller didn’t have the strongest game against the Maple Leafs, but he still did his part in the shootout by giving Buffalo a chance to win the game. 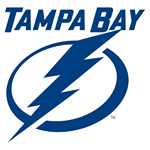 The Sabres currently sit in 12th place with 30 points, three points out of the eighth place seed in the Eastern Conference. The New York Rangers are the current eight seed in the playoff picture. – With his assist on Vanek’s goal, Tyler Ennis now holds a 4 game point streak (2G + 4A). – Ryan Miller stops 38 of 39 shots giving him his second straight win. – Thomas Vanek – Tyler Ennis – Ville Leino’s line could be one of the hottest unit’s in the NHL if they keep their speed and intensity up. – Andrej Sekera missed his fourth straight game as he’s still out due to an upper body injury. – Drew Stafford was a healthy scratch. – That loss was only Montreal’s third regulation loss on home ice. They’re 20-6-5 on the year so far. After that 6-1 loss over month ago, Buffalo has beaten Montreal in three straight meetings, each time it’s been in a different fashion. First a shootout, then Steve Ott’s overtime winner, and Saturday it was in regulation.